Namesake - W.L. "Gander" Terry was a Marion native. He was a former football player, an athletic director, an assistant football coach and a head football coach. He also played on the old football field where the Ivan Wilson Fine Arts Center now stands. Terry graduated in 1927 and was inducted in the University's Athletic Hall of Fame in 1997. He died in 1991 at the age of 83. The colonnade was dedicated to him on July 23, 2003. 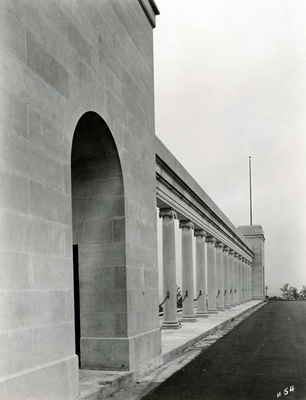 This Classic Revival colonnade once served as the entryway to an athletic stadium. It was built at an original cost of $50,000 and was completed in November 1927. The Stadium replaced a limestone quarry on the northeast side of campus. Lights were installed in 1946, and metal bleachers replaced wooden bleachers in 1963. Constructed of limestone by the Raymond Construction Company of Bowling Green, this colonnade contributes to the character of the campus. Although the athletic field has been replaced by the Ivan Wilson Fine Arts center, the stadium seats continue to serve as an amphitheater. Historic Architecture at Western Kentucky University, Kentucky Library & Museum, 1998.